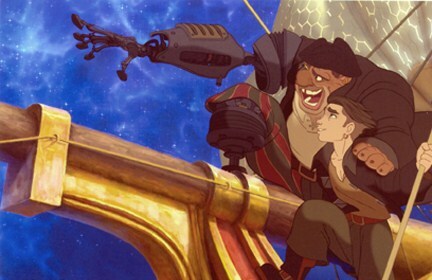 I have never watched 'Treasure Planet' before until yesterday as my friend had it on DVD and thought, why not! and it turned out to be much better than expected! Throughout the movie, I couldn't help but think about Final Fantasy, Avatar and Star Wars. 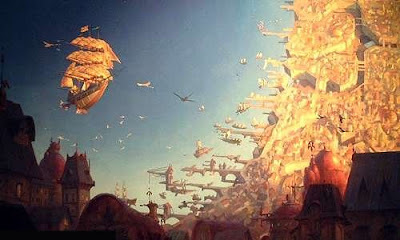 Even though this movie was made in 2002, there are some very modern and cool ideas which others may have taken from. The setting and visuals are pretty breathtaking too. The plot was extremely simple and got straight to the point. It was easy to follow and had a complexity that wasn't mind-boggling, yet not too shallow. This is perhaps brought about by the rather interesting characters with rather conflicted ideals. Firstly, we have the rebellious protagonist Jim who has an attitude and some would rather dislike his 'brat'-like demeanor- though I would praise Disney for his rather modern hairstyle! Then we have Billy Bones who is the supposed villain but is conflicted when he takes Jim under his wing and becomes a father figure for him. Whilst the story is primarily an adventure, these relationship details take the movie to another level, something relatable and emotional and in that way impacts us as an audience; Disney and Pixar Disney are great at this! As it does follow a typical adventure storyline, the ending and climax was a bit predictable but nevertheless finished in an appropriate and cheerful way. The way the movie also bookends the film with similar shots and sequences at the beginning and end is a nice detail. Other voices by Patrick McGoohan, Daid Hyde Pierce and Martin Short. 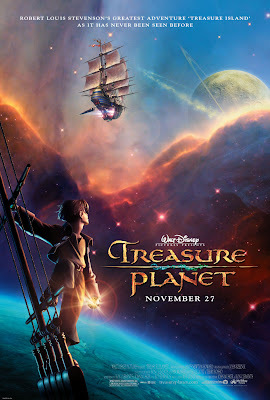 I thought Emma Thompson did a great job as Captain Amelia- she stood out as one of my favourite characters due to her bossy personality and the quick witted things that come out of her mouth! I also really liked Morph- it wouldn't be a Disney film without an awesome side-kick! 'Treasure Planet' was a pleasant surprise. Despite low commercial success, this film fits in well with the Disney Family and definitely brings something new to the collection of great titles out there. The beautiful settings, interesting characters and a direct plot make this film enjoyable for everyone!